This Hot Air Balloon was out in the middle of the day recently,which is very unusual,so my guess is there was a young pilot in training.The reason I came to my conclusion is because they came down almost touching the ground to the left of the road here and then took off again. It was a perfect spot to land but they climbed and did this manuever several times across the valley here. I got all excited when I saw they were coming low ,and when this Mennonite buggy stopped at the stop sign,I knew I had a shot. He actually went left at the intersection but he must have been worried the horse was going to get spooked because he sat here a good minute or so. 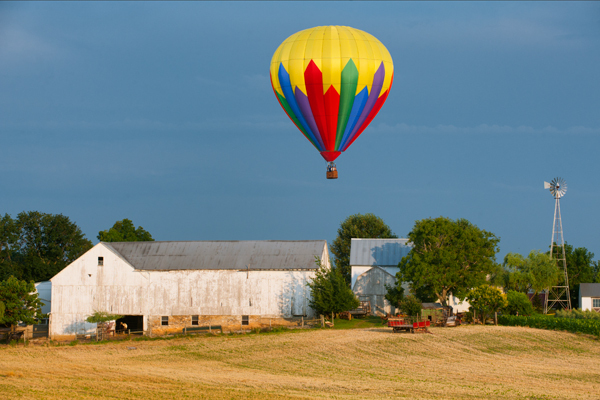 The Mennonite girls on the bicycles had a great view because the balloon was about ten feet over their heads as it drifted over them. 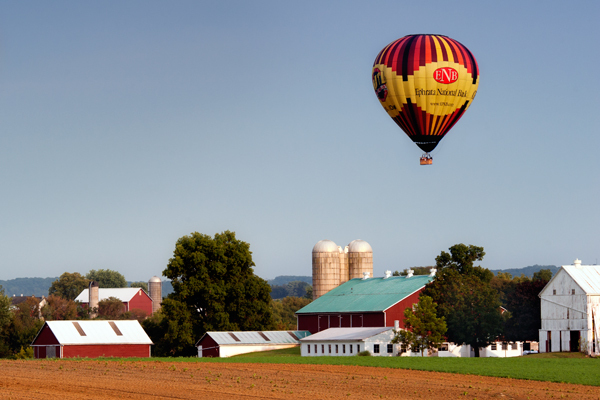 Just another day in Lancaster county,Pa. This hot air balloon finally got to a spot low enough that I could include some of the farm landscape below it.Hot air balloons can be a bit of a challenge to shoot,especially on an evening like this when it was slightly breezy, because they cover so much ground that keeping ahead of them and putting yourself in the right spot for a shot becomes tricky. The crew landed in a farm field shortly after this shot was taken. 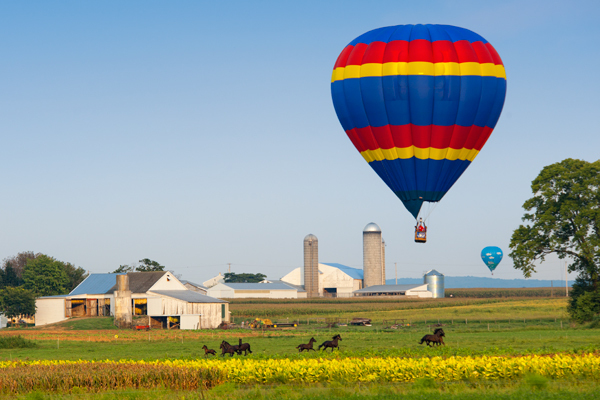 Another image from a local balloon festival.Shot this from my truck roof because you could not even see the farm from road level because of the corn crop. Seven feet higher can make a huge difference. 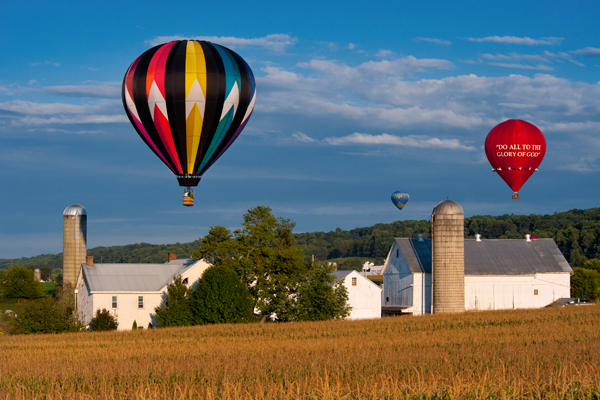 The balloon on the left was asked to go low over the farm by the chase crew after they recognized me from last year and knew to heed my request to get them a great shot. It’s amazing how they follow the same path,because the red balloon had been in the same spot as the nearest balloon minutes before. 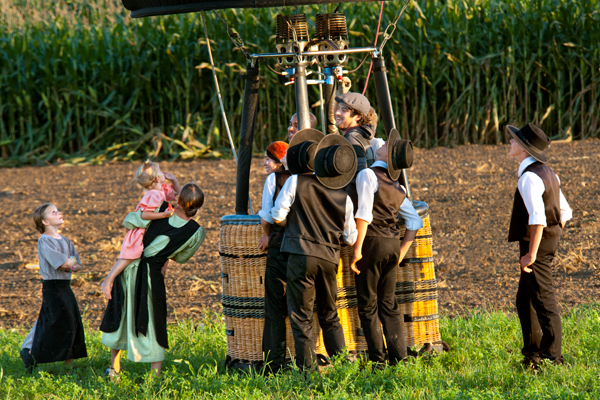 After following this hot air balloon one evening, it finally landed at an Amish farm and these young people came out to see the balloon being packed up.I shot this from across the street with about a 400mm lens as the audience looked up into the balloon. The young men actually happily pitched in to wrap the balloon up and carry it to the trailer. Coming in hot means coming in at a reckless speed, which was what this balloon was doing as winds picked up near touchdown. It scraped a tobacco field,took out a rope fence and finally drug to a halt. The horses took off running in every direction as the balloon descended.This very same balloon somehow got caught on a high power line the next day and actually was starting to smoke before the wire snapped and fell to the ground. Amazingly no one got zapped. I was chasing this balloon the other day and when it finally landed I drove up a dirt lane to watch it deflate.This Amish lady and her children pulled right into the field beside me,and initially the kids got out to run over to the balloon but the boy started crying, so they loaded back up on the wagon and I had enough time to get a photo.The girl had a basket of homemade treats that she was holding,and I was in my truck about 15 feet away hungry for a snack. 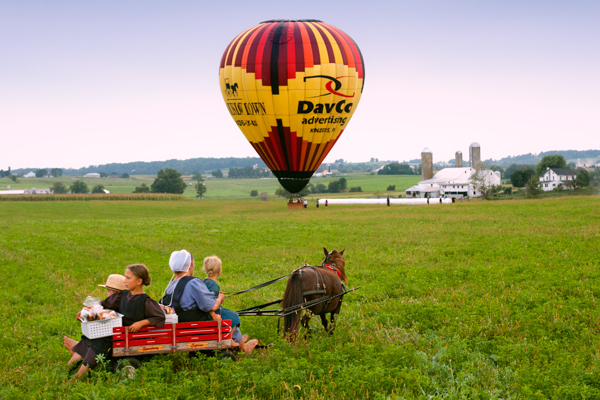 A hot air balloon takes tourists for a breath-taking ride over the many Amish farms that dot the landscape.